Posted by Chris Eaton in architecture, artitecture, EA, mentoring, methods, people. My standard answer to this is to talk about the difference between cityplanners who think about city wide infrastructure and future objectives (enterprise architects) and architects of individual buildings who think about how the house is laid out, how strong roof supports need to be and whether their plan will fit to the city planners constraints. in essence as a developer (a specialist in IT) you know lots about a specific IT subject matter. For instance you know how to write J2EE applications, test the code, deploy this into a container, use an integrated development environment and so on. Detailed stuff. In terms of exposure to different types of technology the experience is fairly narrow, working with specific technologies and probably with little care whether the solution is in a Human Resources, Finance, Supply Chain, Procurement and so on. As a specialist you have some understanding of a particular business area but little thought or care for business strategy. 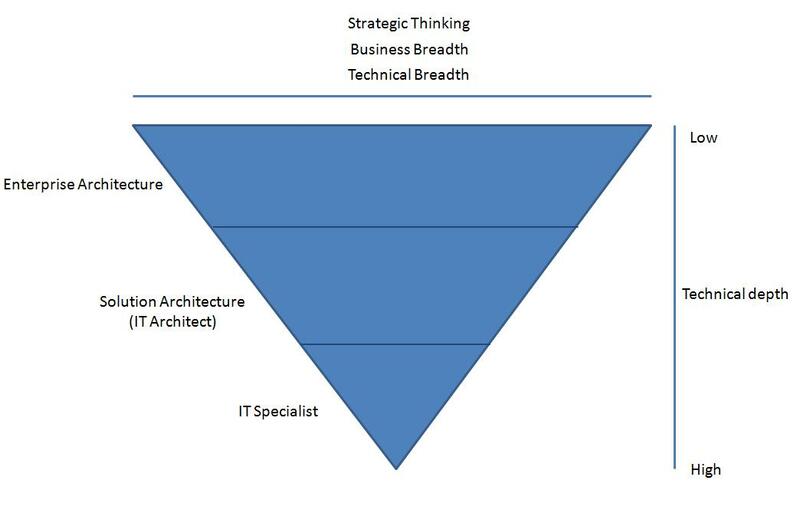 This growth in business and technical exposure leads to a point where there is a choice: remain specialised or loss the specialism and become more broadly focused – become an architect orchestrating the build but not directly building (rule of thumb says if your write code regularly you are probably not an architect). Your sphere of influence is your code and immediate team. Interpersonal skills are not so important as long as the code works! Within the architect space the breadth of technical experience grows, but the hands on technical experience is shallow. On occasion deep dives return you to the specialist space. You have the experience and credibility from the specialist experience to generalise, relate and guide specialists without ever having to have directly worked with the technology. The trick here is to use specialists for their specialist skills, and bring this together at the solutions level. In business terms you have probably medium to deep understanding in one or two or perhaps more business areas. In strategic terms you probably have thought about business strategy within a business area i.e. Finance or Supply Chain, but probably not in a true enterprise sense. Interpersonal skills are becoming increasingly important to communicate your ideas and sell them to your immediate project team. The transition to an architect did stretch me, it was difficult to give up the security of specialisation but it was a decision i never regretted. you have very broad and shallow exposure to all kinds of technology and business area with depth in some areas. You have a good understanding of technology and technological concepts but the detail isnt of significant interest but the impact it can make is very interesting particularly how it could reduce the cost of doing business or differentiating the business in market. In strategic terms, and for me this a key differentiator for Enterprise Architects, you have a good understanding of business strategy models (i.e. Porter), think in broad business and IT terms and can apply this knowledge to sell a vision of the future, the benefits of the future vision and how it can be realistically achieved. Your sphere of influence is to aim for company wide impact through process or IT change and influence people who didnt even know they needed influencing! My own experience of moving from architect to enterprise architect was similar to my transition from specialist to architect, i felt i was giving up a comfort blanket in business and technology architect specialisation for a very broad, perhaps somewhat inspecific role with an emphasis on strategic and inter personal skills, and not too emphasis on technology expertise – something which i had always seens as a personal strength and passion – but again i never regretted the move it was right at the time and i really enjoy the influencing aspects to my EA roles. In summary, I hope it is clear that business, technology breadth and strategic business thinking is way to become an Enterprise architect, it will take work, it will take opportunity and a good dose of sponsership but in my view it is well worth it.